Hi Guys, Hope you are enjoying Recharge tricks and best offers on Hexcode. 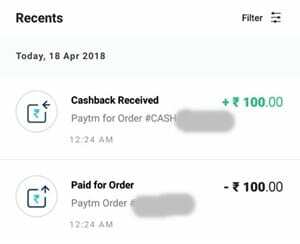 Today, you can get Free Recharge of 100 Rs by using this Paytm loot offer. 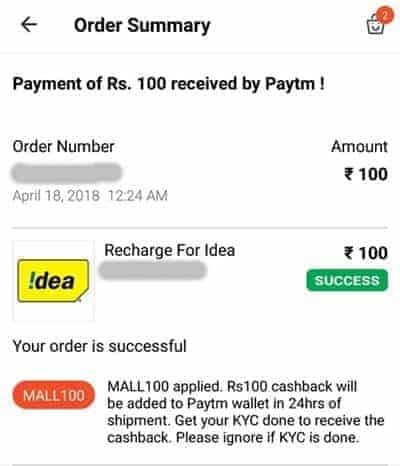 Paytmmall offering 100% cashback on first order. This Paytmloot offer is valid for all new users only. Apply all given codes in sequence and you will get total 20+25+50 = 95 Rs recharge free. It should be your 1st Recharge of the month. The user will get flat 20 Rs cashback. You will get flat 50 Rs Cashback. Note- Your paytm account must have KYC verified to recieve cashback. Note- Please don't do special recharge as they are valid for circle wise and your recharge will fail. You will get 30 Rs cashback instantly. Valid for all Paytmmall users. Coupon will apply only if you are recharging your mobile number for first time on Paytm. Now apply any promo code given above. You will get cashback instantly according to the promo code. You should have KYC verified to receive cashback. Can we pay by wallet balance for that 100% offer?? Is kyc Account necessary for 100%cb using idea, bihar offer? ?